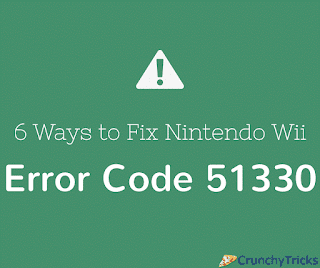 Wii error code 51330 among several other errors is an instance where the Wii console is unable to connect online. It displays a error message “Unable to connect to the internet.” You can come across this issue several times due to various situations such as Connecting Nintendo Wii to the web, playing online over the internet, etc. This error code indicates that the connection process between the Wii and the wireless router has failed and denied internet access to the console. This error is caused due to numerous reasons with the most common ones being an Incorrect wireless password, Switching of security type between WPA/WEP, Misconfiguration of the wireless router, Firewall settings, etc. Here are a few tips to resolve this error in your console. Just follow them to get rid of error code 51330. With the most common solution being more careful while entering the security passcode of the router on your console. Note that the passcodes are case sensitive and use of special characters are allowed. Therefore reentering the passcode carefully usually solves the issue. Using Wii remote, Go to Wii button>Wii Settings>Wii System settings>Select ‘Internet’>Connection Settings>Change settings>Type of wireless settings>Enter Wireless network’s password>Confirm>Save. Restart your internet connection. If this doesn’t work, update your wireless settings and retry. Don’t forget to power cycle your modem & router, i.e. Switch OFF your router & modem for few seconds and then just turn it ON simply. Then surf through router's settings. You’ll find it mostly under “Wireless Settings” section. After locating it, click on Mode. Most routers provide a list of mode options. Select 802.11 b/g as an appropriate setting. Some manufacturers refer to it as “Up to 54Mbps” or “Up to 300Mbps”. For 802.11b/g, “Up to 54Mbps” is equivalent. It fixes the issue. If still the problem persists, change the router’s broadcast channel to 1 or 11. It is because sometimes the speed is too slow to be accessed by the console. By default, routers use channel 6 to broadcast. Instead, change it to channel 1 or channel 11. You can find it in the router’s wireless settings menu. It is a drop down menu usually listed under the name “Standard Channel” and set to Auto, instead, switch it to Channel 1. Also make sure that if the MAC filtering is ON on your router, you enter the console’s MAC address to the list of approved MAC address. If all the above method doesn't work for you then try entering the IP address and DNS manually in the Wii settings. Sometimes it is not configured correctly. If the manual configuration doesn’t work, then run the following commands Ipconfig/all>Exit. Now restart your router and check the internet connection. Sometimes, the firewall protection temporarily blocks the internet access to the console. Then, disable the firewall and access the internet. If the service provider changes the IP address, the console cannot access the internet. Try entering the IP address manually and reconnecting. Also, try updating firmware of the wireless device to match the latest configuration. These tips are the most you can use to resolve this issue.